“Mark of the Devil” begins with a group of local witch-hunters chasing down a monk and two nuns who, it has been decided, are in league with Satan. A public execution in the town square follows, including the removal of the monk’s fingers and his tarring and feathering. It was indeed a spectacle and we even hear, “Strip him – that way the women will enjoy it too!” Women who were regarded as the object of temptation suffered terrible fates and since those who hunted witches were men, we can expect the worst treatment of women possible. The ugly Albino (Reggie Nalder) organized these hunts. 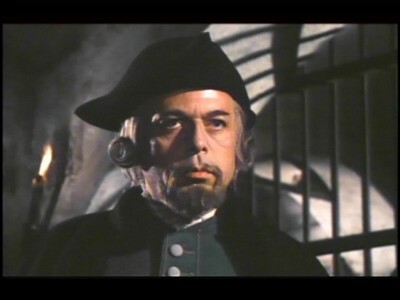 But then Christian (Udo Kier) comes to the local tavern and advises Albino that he’s arrived there ahead of his master, Lord Cumberland (Herbert Lom), who will arrive shortly to oversee future witch trials. Obviously, this upsets Albino and he’s quick to pick up on the chemistry between Christian and barmaid Vanessa (Olivera Katarina). When Albino tries his luck with Vanessa he is rebuked and condemns her as a witch and tries to take her into custody. Christian has something to say about this and here starts the story that exposes his own lust for women. Christian believes that he has been employed to undertake God’s will, Albino is ambiguously conscientious about his approach to his work and Cumberland sees corruption within the local authority’s ranks. These three points give intrigue to the film. That is not to say that the film is not exploitive because it most certainly is. We see young women stretched on the rack, stripped naked, whipped, raped, having their tongues torn out with tongs, burned and so on. It even becomes more violent when we understand the terror that these women feel. Cumberland is frustrated because he is impotent and this is what causes him to act so madly. Christian understands to mean that God does not want dead people; he wants confessions. However when Christian falls for Vanessa, he begins to see the atrocities as an excuse to swipe valuables and land from the aristocracy. 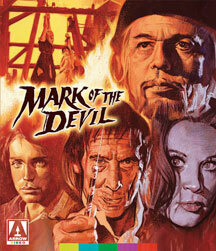 Aside from being a cult film, “Mark of the Devil” is an important chapter in the history of exploitation cinema as it managed to deliver extreme material in the context of an historical, deeply pessimistic story. It shows us an utterly compromised world in which innocence has little value, money will just get one killed, and almost anything can be seized under the guise of the church. The cast is totally wild and participation in this movie went on to open doors for many of the actors. By today’s standards it is somewhat mild but it certainly gives us a look at horror as we once saw it and it will continue to remain a standard for many horror film aficionados. This entry was posted in Film, Uncategorized on January 30, 2015 by Amos.